The WP1 participated in the workshop DFP17 (Digital Fluid Power 2017) in Aalborg, Denmark, September 7-9 with all the members of the work package (Viktor Hristov Donkov, Sondre Nordås, Daniel Hagen, Torben Ole Andersen, and Morten Kjeld Ebbesen) and a guest of the WP Damiano Padovani. The workshop was dedicated to the different aspects of digital hydraulic. The workshop included 67 participants with the majority from Europe, and the industry was well represented. The WP presented two papers and received valuable feedback. 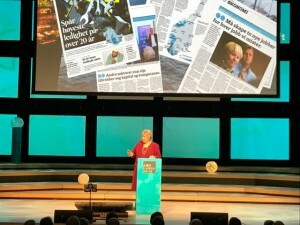 Erna Solberg, The Norwegian Prime Minister, held a speech at Agderkonferansen January 24 in Kristiansand. 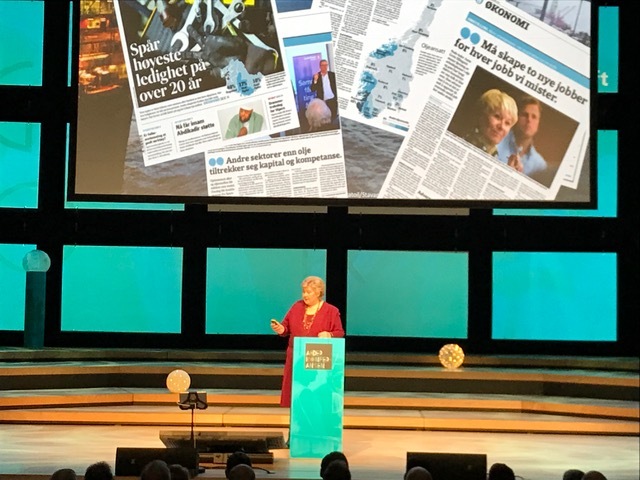 She talked mainly about the challanges Norwegian Oil and Gas industry is facing, and that R&D must be a tool for the industry to meet these challenges. The SFI Offshore Mechatronics project is handling these issues, and the reseach done in the center will hopefully contribute to this development. Agder is one of the regions in Norway that suffers the most of declining oil prices and lack of order reserves. This is one of the main reason for the Center to speed up and get results back to the partners as soon as possible.